The What To Wear To MY Wedding Guide Every Bride Needs To Share With Her Wedding Guests! You know how I’m always saying – we don’t take care of our guests enough? Yes, the same people you’ve already organised hotel rooms, logistics and food for? Yeah, sorry to burst the bubble, but that’s not enough. You have to do more than just pay for their food, you know. When someone’s a guest at your wedding, it’s your responsibility as a host to make sure you’re giving them the best experience possible. Or at the very least, make it as smooth a journey as possible on the days they’re with you. 3 years ago, I had a couple of friends flying to Delhi from Mumbai to attend my wedding. Some of them were Catholic, and some thought Delhi wedding = bling bling bling only. 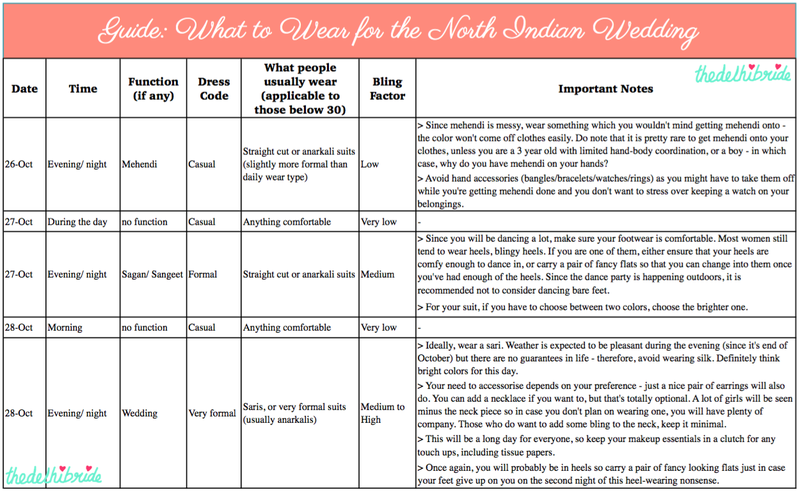 I realised they were clueless about what to wear to my North Indian Hindu wedding, and so I quickly made a personalised Little Wedding Fashion Guide for them so they didn’t feel out of place. It included all the different functions, time of day, dress code, what people usually wore on that particular function, the “Bling Factor” and any important things to keep in mind. Since mehendi is messy, wear something which you wouldn’t mind getting mehendi onto – the color won’t come off clothes easily. Do note that it is pretty rare to get mehendi onto your clothes, unless you are a 3 year old with limited hand-body coordination, or a boy – in which case, why do you have mehendi on your hands? Avoid hand accessories (bangles/bracelets/watches/rings) as you might have to take them off while you’re getting mehendi done and you don’t want to stress over keeping a watch on your belongings. Since you will be dancing a lot, make sure your footwear is comfortable. Most women still tend to wear heels, blingy heels. If you are one of them, either ensure that your heels are comfy enough to dance in, or carry a pair of fancy flats so that you can change into them once you’ve had enough of the heels. Since the dance party is happening outdoors, it is recommended not to consider dancing bare feet. For your suit, if you have to choose between two colors, choose the brighter one. Ideally, wear a sari. Weather is expected to be pleasant during the evening (since it’s end of October) but there are no guarantees in life – therefore, avoid wearing silk. Definitely think bright colors for this day. Your need to accessorise depends on your preference – just a nice pair of earrings will also do. You can add a necklace if you want to, but that’s totally optional. A lot of girls will be seen minus the neck piece so in case you don’t plan on wearing one, you will have plenty of company. Those who do want to add some bling to the neck, keep it minimal. This will be a long day for everyone, so keep your makeup essentials in a clutch for any touch ups, including tissue papers. Once again, you will probably be in heels so carry a pair of fancy looking flats just in case your feet give up on you on the second night of this heel-wearing nonsense. As you can see, it was personalised to my own wedding, with my specific preferences and the arrangements I had made. While a lot of Delhi might be all about the bling, I knew that my own circle of family and friends were more minimalistic with their fashion preferences. I know a lot of people wear Indian clothes during the time in between functions as well, but I didn’t want my friends to bother with buying even more (ethnic wear) outfits just to have something to wear while they ate lunch at my home. So I made sure they knew they should literally wear whatever they’re comfortable in. I had a Hindu wedding in Delhi in late October, when it starts to get chilly in the evenings. Make Your Own Wedding Fashion Guide! Step 3: Attach to an email and send it to your friends! The weather. Should you ask your guests to carry shawls? Or avoid silk because it will be too hot as it’s an outdoor wedding in April? Your culture. A Marwari wedding might see guests dressed very different from a Telegu wedding – tell your friends what kind of clothing all the other guests will be wearing! So I figured – why not? Everyone should be doing it! You’re the bride, and you’re the only point of contact most of your friends will have at your wedding. Sure, you’ve given them your brother’s/chacha’s/aunty’s number to coordinate all the logistics, but they’ll never feel comfortable enough to call them up and ask, “Is it appropriate for me to wear a red gown to your Reception?” But they’ll also think 10 times before calling up the bride in the week leading up to her wedding! Do them a huge favour, and make this document and email it to them. You’ll be saving them, and yourself, a whole world of trouble! It will just take you 10 minutes right now. Ok, 12 minutes if you’re converting to PDF. What do you think about making a guide like this for your wedding guests? Especially for friends from other cultures who are flying in for your wedding? Great! When is your wedding? This will help her plethora of friends I bet! As an American guest going to a wedding in India, I am so grateful that our bride did this. We still feel clueless, but much less than we would have without the guide.